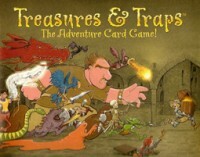 Treasures and Traps is a light adventure card game that puts you on a quest for riches. Each card can open the door to a tricky challenge, a magical assistance, or a valuable treasure. Be the first player to get a Gold, Silver, and Bronze TREASURE card into your realm. Your other cards give you the powers you will need to keep others from winning and to protect your goods. Nominated as an ORIGINS AWARDS finalist (2006) for Non-Collectible Card Game of the Year. The Spiel chats with designer and artist Aaron Kreader to learn about this rpg themed card game. Welcome to the 75th Annual Hung*koff* ADVENTURER GAAAAAAMESSSSSS! And welcome to Treasures and Traps: A Fantasy Themed Card Game of Gateway Proportions. Prove yourself as Top Adventurer of the Realm by being the first to gather a set of Bronze, Silver, and Gold Level Treasure cards in front of you. Treasures and Traps follows a standard what I call ‘Card Zap’ or ‘Help Me, SCREW YOU!’ format. You play tongue-in-cheek fantasy trope cards on yourself of a BOON variety while sabotaging other players with BANE aspects. Play cards. End your turn. Draw/Discard to 5. Rend and Repeat. Items, Treaures, Monsters, Traps. Build Yourself up and Back Stab the Competition. Cast a Spell of [Insert Funny Word Here]. Mmmmmmmmmmm…I smell the scent of freshly baked doughnut holes in the morning! Playing and destroying cards – the Entry/Exit aspect of the game – requires a die roll. Each card has an Entry and Exit number and you must tie or beat that value to bring a card to the table or send that malingering thorn in your side to the great beyond of the discard pile. Fail your Entry roll and it is bye-bye bounty and off to the discard pile with ye. Fail your Exit roll and that knife in your back gets twisted for another turn. Hmmmm…who put this ‘luck’ mechanic in my ‘throw-cards-at-your-face’ Yellow Brick Road Choral Group gameplay???!!! This aspect of Treasures and Traps sets it apart from the standard ‘what’s in my hand’ play and adds a light element of strategy as you stock, spellsling, steal, and stymie your way to the Winner’s Circle. Do you start off slow and build a realm that will give you roll boosts later on down the line or do you play aggressively with fingers crossed trying to get those bigger and badder cards in play from the starting line? By reading now…you get a second slice of review chatter pie absolutely free! Expanded Realms the First comes with a dozen new cards to throw into the competition deck, like the Prismatic Cape that can become a treasure of any level. Connivingly Colorful! Players can now choose a starting class card to give them a little Variable Player Power boost as they enter the Iron Adventurer Competition. Will you play as the Priest? Resurrecting creatures from the discard pile, dispatched by the Warlord and his bonus to Exit roll Creatures. How will the Blacksmith fare with a bonus to Entry and Exit items? Is he just creating fodder for the Rogue who can place an item in her Realm instead of discarding it by beating an Exit roll by three? Treasures and Traps might not be kicking down the doors of assorted keeps on assorted borderlands with the tried and true Adventurer vs Adventurer in a Race to the Finish theme, but it is a winner in its own right. Quirky art winks at fantasy tropedom on little cardboard rectangles. Once those first few coveted treasures hit the table – the race begins as you defend booty with one hand and back stab with the other. Treasures fly back and forth fast and furious from realm to realm and tantalize from the spoils of the Wildlands. Watch your back and don’t blink – because before you know it someone is going to have a precious metal trifecta and become an Adventuring Olympian. 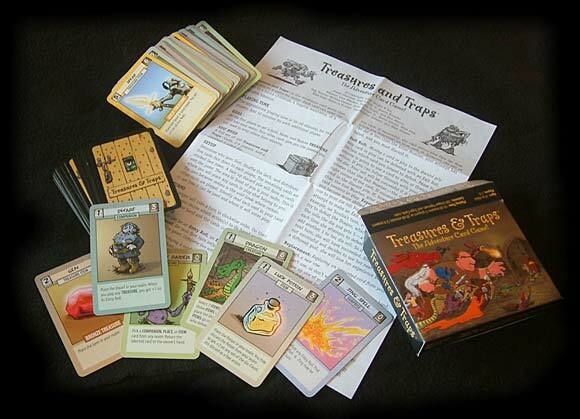 Treasures and Traps is a fast and furious appetizer of an ‘Opening Act’ or ‘Filler’ game that brings a little fun to the table before making your big Descent of the evening. Add a Review for "Treasures and Traps"